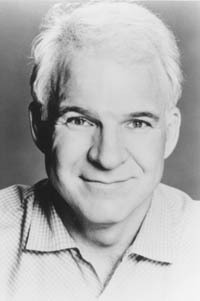 As a young man, Steve Martin sold magic doodads on Disneyland's Main Street, and performed comedy at Knott's Berry Farm. He then studied philosophy at Long Beach State, which sounds like a Steve Martin joke but isn't. In the late 1960s, Martin wrote for The Smothers Brothers Comedy Hour and The Glen Campbell Goodtime Hour. His first on-camera fame came alongside Ray Stevens, the country/comedy songwriter who wrote "Ahab the Arab", "Gitarzan", and more seriously, "Everything is Beautiful". Martin was in the cast of The Ray Stevens Show, a 1970 Canadian sketch comedy series which aired in America as a summer replacement for The Andy Williams Show. It didn't make Martin famous, but it led to supporting work on several other comedy-variety series through the early '70s, and regular appearances on Johnny Carson's Tonight Show. Martin was mostly a stand-up comic through the mid-1970s, developing an absurdist persona on stage. He shouted "happy feet" and danced, played his banjo, made balloons into animals, and made the exasperated "excuuuuse me" into a national punchline. He's widely associated with Saturday Night Live, which Martin has hosted more often than anyone else. But no, he didn't host the debut (that was George Carlin), and in fact Martin didn't appear on SNL at all until midway through the show's second season. He hosted three episodes in the show's third season, and as looted artifacts from Tutankhamun's tomb toured the country in 1978, Martin performed his tribute song, "King Tut", on SNL, accompanied by The Nitty Gritty Dirt Band as the Toot Uncommons. For a while, Martin was as popular as any rock star, with huge-selling albums "Let's Get Small" and "A Wild and Crazy Guy". The true fans read and re-read his collection of short stories, Cruel Shoes. Martin's movie career started with a silver-hammer-wielding cameo in 1978's bizarre Beatles tribute film, Sgt. Pepper's Lonely Hearts Club Band. In 1979, Martin starred in The Jerk, as a simpleton who was raised a poor black child and fell in love with Bernadette Peters. The Jerk was an enormous hit, but Martin seemed to grow tired of his own wild-and-crazy act before America did. Perhaps he noticed the faded career of Jerry Lewis. Whatever his motivation, Martin followed The Jerk with Pennies from Heaven, a depressing Depression-era musical drama that bombed, and Dead Men Don't Wear Plaid, an innovative film noir spoof in which he acted opposite clips from old-time stars. After that, Martin made some of the most popular comedies of the 1980s and early '90s, including All of Me, Three Amigos, Roxanne, Planes Trains and Automobiles, Dirty Rotten Scoundrels, and L.A. Story. With Parenthood in 1989, Martin began making more serious dramatic films, including Grand Canyon, Leap of Faith, and The Spanish Prisoner. Throughout the 90s, Martin's dramas came between less-than-his-best comedies like Father of the Bride, Mixed Nuts, and Bowfinger, and certified stinkers like Sgt. Bilko, The Out-of-Towners, and Cheaper by the Dozen. Martin wrote the screenplays for Roxanne, L.A. Story, and Bowfinger. He also wrote the novel and movie Shopgirl, and the play and movie Picasso at the Lapin Agile. He collects art, and no longer wears an arrow through his head.